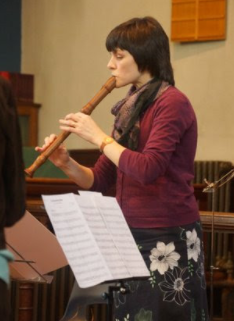 The Biber Recorder Duo are a Bristol based duo playing virtuosic repertoire for one and two recorders who take their name from the Bohemian-Austrian composer and violinist Heinrich Ignaz Franz von Biber. Jen Mackerras and Tim Lanfear will be returning to the New Room for another lunchtime recital. 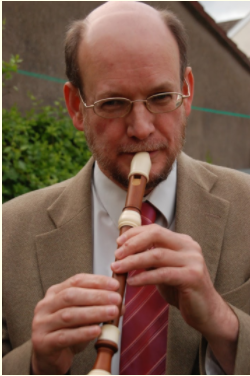 Lunchtime recitals are free, with a retiring collection. Jen and Tim met as founder members of the Pink Noise Recorder Quintet. 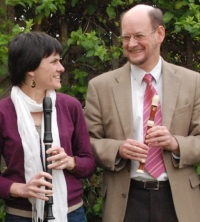 After playing together for a number of years, they decided to explore the wealth of repertoire for two recorders, and to enjoy the discipline and depth of communication the duet music requires. They love playing together, and can’t wait to bring audiences into the sound world and dialogue of recorder duet music.